Do you often have to define test executions that require similar test suites to be assigned to same group of testers? If yes, then you can now use Execution Templates which make the definition of test executions even more easier. An Execution Template can be treated as a basis for the test execution definition. 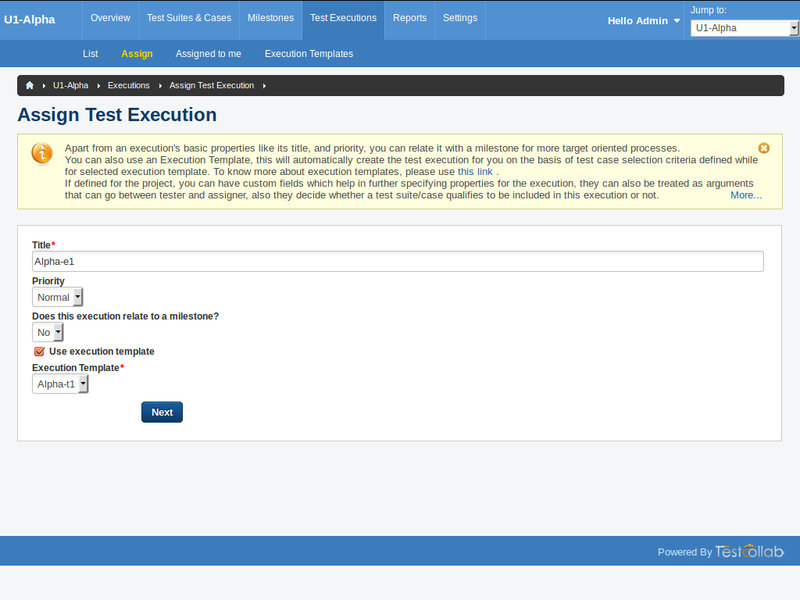 Execution Templates once defined can be used to create new test executions on their basis, without any need to go through test case selection and assignment process for every test execution. You will get the option to manage execution templates by navigating to Test Executions -> Execution Templates while working for a project. Adding an execution template is a straight forward process where you start by giving the template a name and then you provide test case selection criteria.There can be more than one test case selection criteria defined for a template. 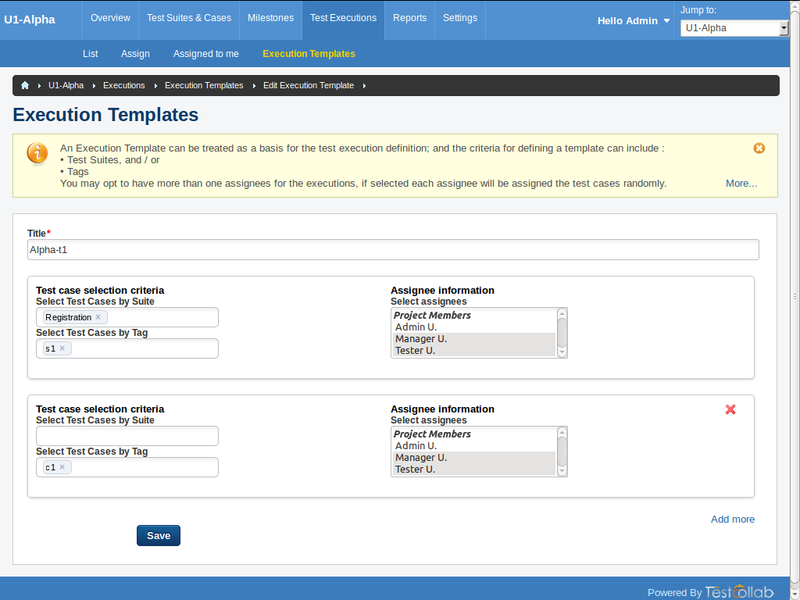 For every test case selection criteria you either need to select the test suite that holds the test cases that you want to be included in template and eventually be part of the test execution, or you can also select tag if you want assign all test cases that have a particular tag associated with them. Please note that you can also have both test suite and tag selected for a particular criteria. Once the criteria is defined you can select one or more testers who need to be assigned the test cases that fulfill the selected criteria. Please note that if more than one tester is selected for a criteria then the test cases would be assigned randomly. There can be more than one sets of conditions defined under an execution template. When an execution template is defined it can be viewed , edited or deleted. While creating a new test execution you have an option to "Use execution template" , when this option is checked you can select an existing execution template from drop down provided. Once a template is selected you do not need to follow the second step of assignment which includes selection of test suites / test cases and also selection of assignee testers. Clicking "Next" would simply create a test execution on the basis of one or more test case selection criteria you have set while defining the selected execution template and the test cases would be assigned to tester(s) selected in execution template.